In recent years Canada, the US northern neighbor is more and more often becoming one of the favorite tourist destinations not only for “southern brethren” but actually for tourists from all over the world. The magic of the country is its still mostly unspoiled nature. From hilly eastern provinces through the best of Rocky Mountains to beautifully carved west coast – whenever you turn - the Mother Nature generously opens to visitors. However to explore Canadian wilderness (as most of country’s territory is really “pure wilderness”) you should forget about 5 stars hotels and seriously consider RV-ing. To get “close-up and personal” with Canadian Nature you may have to simply “hit the road” – and the best way to do it is by exploring the country carrying your “home” with you. Canadians seem to well understand this truth; that is why Canada is home to many well-recognizable manufacturers of all kind of campers, travel trailers and RVs. As a sign of time and our growing eco-consciousness, most manufacturers are rolling-out “environmentally-friendly” mobile homes (well, who should show respect to the Mother Nature if not nature lovers?). Below we would like to make presentation of Canadian companies designing and manufacturing modern lite-weight campers, travel trailers, camper vans etc… Thanks to the tremendous progress of technology and art of design, most modern models are just lighter (but sturdier and spacy), more economical (“out of the pocket” but also in operation and maintenance) and definitely more stylish than their “old-style” predecessors. You want to buy, lease, or just rent? It is your choice but it is our pleasure to make the presentation of what is available on the Canadian market. The founder and owner of the Trillium Trailers – Joe Thoen started the business some twenty years ago. Their latest “hit” called Outback is a modern, lightweight incarnation of an old success from 70’s called Boler. But Outback is much more than ‘old-in-new-package”. Trillium Trailers used the most advanced technology, design ideas and testing process to make sure that what leaves the factory is not only comfortable but also very reliable. Trillium Trailers is a small company, may be that is why they took quite different approach to the production, sale and promotion. The Outback comes with few floor-plans, but the customer can choose the preferred one and specify some aspects of decoration (wood, fabrics….). The camper undergoes rigorous final tests at the factory (tests for water leaks, tests of all appliances etc…). Finally the last part of commitment – all units are being sold “out of the factory” bypassing dealers. These decisions made big changes – the rate of customers’ complains dramatically dropped, no wonder – reliability and quality impressively increased. Bigfoot RV located in Armstrong (British Columbia) is in RV business for more than 30 years. These days their product line includes family of truck campers and model of travel trailer. Given such long history and experience in campers’ business, the company proved dedication to the design, quality and continuous effort to improve their products. 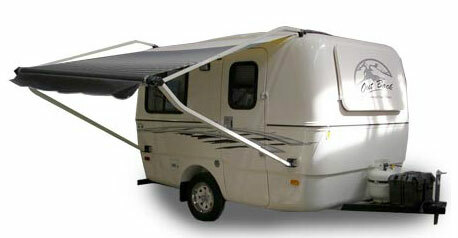 The 1500 series of Truck Campers is the lightest of all campers. It includes both - short-box and long-box models and correspondingly several floor-plans to choose from. The dry weight, depending on the version is in the range of 2,000 – 2,200 lbs. The 2500 series of Truck Campers is a bit heavier (from 2,800 to 3,000 lbs), but models are more roomy and come with more floor-plans. For the pleasure of travelers, Manufacturer of ultra-lite trailers made in Canada. The history of ProLite is like from an American book. It all started in Martin James’ garage of at the turn of the century (actually millennium, because it was year 2000). That was the workshop where James built his first travel trailer. It was sold at the dealership like a hot bagel. So then came the next one – this time bigger trailer and to make it short – the rest is a history of the ProLite camper business located in St-Jerôme (Quebec). Smallest in the family of ProLite campers - "Suite" weights only 550 lbs and can be towed by even small car. With length of 11'10" it can sleep 2 people. One of largest campers from ProLite - Extreme 23 weights 3450 lbs, measures 24'4" and sleeps 6 people. From the beginning James followed his vision specializing in light weight segment of the travel trailers market. Given the fact that most of ProLite travel trailers can be towed by compact cars, the company opened an almost “unlimited” market for their products. But ProLite does not compromise quality for weight – models are built from high quality and highly esthetic materials including real wood! By all accounts ProLite with its production approaching thousand units per year is small company. But it dynamically expands out of Quebec across Canada. And this is just the beginning! Today the line of products includes some appealing small, lightweight travel trailer models like, Suite, Eco-12, Mini-13, Cool-13, Profile 14, Plus, Plus-S and many others. 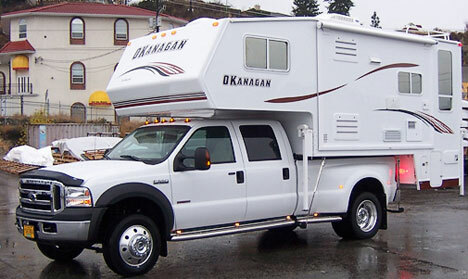 Okanagan, located in British Columbia manufactures Truck Campers, Travel Trailers and Fifth Wheels. 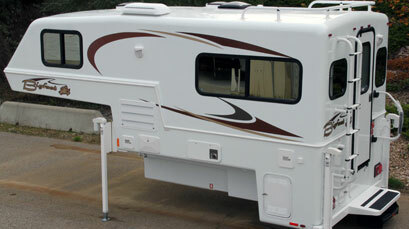 Each type of campers includes several models and floor-plans. And although mainly only truck campers with weight ranging from 1,600 lbs to 2,200 lbs (slide-out units weight up to 4,600 lbs) belong to the class of lightweight units, all of them share the common characteristics. And this is the Quality. The company believes that cheap means exactly what it means – someone cuts corners! That is why they put a lot of attention to the quality of design, materials and manufacturing process. Their motto goes: “Customers are entitled to quality and sturdy construction even if it is hidden from view”. This approach is even more important given the fact that Okanagan campers are designed for off-road conditions (think wilderness) and Canadian climate. The company carefully balances the need for weight reduction with superior strength and durability of their products. 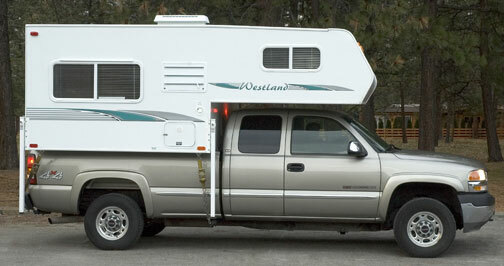 Westland is another manufacturer of Truck Campers and Travel Trailers operating in British Columbia (Canada). The company claims that they have the lightest weight truck camper in North America. Obviously it is not only their more than 30 years of experience in designing and manufacturing campers but also dedication to the idea that “less” (in terms of weight) is “more” in terms of economy, ecological benefits and psychological comfort. And apparently they do it without jeopardizing the quality and living space providing “Home-like away from home” environment….. The company founded in 1965 is located in Winkler in the Canadian Province of Manitoba. It may be worth to mention that Winkler’s area is ethnically a Mennonite community. Their approach to life and believes (high moral standards) have strong impact on the quality of their craftsmanship and that is what you can see in campers manufactured by Triple E RV. Exactly for these reasons the company is deeply vertically integrated to have full control over the quality of all sub-components making their campers. Triple E RV started their operations with little 13 feet travel trailer. Today after more than 40 years in business they are mostly known for their outstanding camper vans distributed under the brand name of Leisure Travel Vans. The family of camper vans includes Serenity, Libero, Sprinter, Spirit SS and Spirit TE. All of them but Libero are made based on an impressive Mercedes-Benz 3500 chassis (Libero makes use of Chevrolet chassis). They all represent very innovative lightweight designs (fiberglass body) with stylish curved shapes and aerodynamic lines improving fuel efficiency (add to that energy-efficient LED lights). They come with variety of floor-plans, some including also revolutionary (for camper vans) slide-outs significantly expending the living area. Most of the mentioned above companies are also represented in US through the extensive Dealer Network, so you can find their products without crossing the border. As Made in Canada, for exploring immenseness of Canadian territory and wilderness as well as Canadian climate, they represent very robust, sturdy, high quality designs that can operate in such conditions and still offer “Home-Away from Home” experience for nature and adventure lovers.